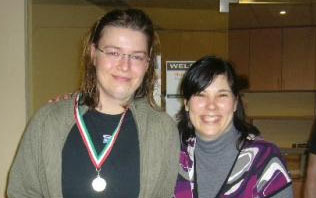 Lautala-Näykki with tournament director Eva Kapscos. apart from the World Champion Mikko". Long-time Racketlon.com co-worker Keith Lesser, also the tournament director of the Doubles World Championships coming up in London in August, shares some of his impressions - and associations - from the tournament below. Much has to be said of Martina Kakosova. Fantastic tennis and never really under huge pressure. In the final it was level going into tennis where Martina like her namesake showed her class. Billie Jean King said about Navratilova in 2006, "She's the greatest singles, doubles and mixed doubles player who's ever lived". Will we soon be saying this about another Martina but in a Racketlon context? Certainly, upon passing and briefly chatting to the champion at 9:30 pm in the hotel on Saturday evening, one knew that with such professional preparation the opposition was in trouble! Susanna Lautala-Näykki keeping up appearances! British sitcom has always been fascinated by snobs, but few were ever as monstrous as Hyacinth Bucket (who insists it's pronounced "Bouquet"), the central character in Roy Clarke's Keeping Up Appearances. Played with aplomb by Patricia Routledge, Hyacinth is a character with few, if any, saving graces. Her pompous, self-serving attitude makes life miserable for all around her. Long-suffering husband Richard (Clive Swift) gets the brunt of it, with Hyacinth quick to chastise if he steps out of line ("I don't like you making decisions unilaterally", she tells him). If Hyacinth was on the tour I think she would be a squash specialist. The referee would have no chance. "I told you it was a stroke not a let, Richard do something, and I told you it's BOUQUET not bucket." A tough profile for Rita Horvath. Tournament Organiser Eva Kapcsos played a blinder and had she not been dancing into the night, with a sore throat and had to put up with Graham Norton's complaints she would no doubt have been a stronger challenger. Compatriot Horvath narrowly defeating Kapcsos for 3rd. King Buda would be proud how she put up with all those pesky Pests! That was what the song was about, right? Although Norton has an interesting point that could be considered at the next FIR Council Meeting "Why are the semi finals of the Veterans Class at 9am when 12th v 13th in Mens C is at 10am". Norton has a valid point and perhaps there can be a new recommendation that organisers do not place semi finals of events before lower matches yet to take place in the Monrad. I thought this was a good headline as I didn't think Krenn would get beat by Beks. The closest challenge however was the Dutchman for Krennski, who slid to victory in his first tour title. Of course the Austrian has confirmed he is starving for more success and looks forward to partnering Michi Dickert in the 2008 Doubles World Champs in London. Krenn was impressive playing with an added maturity. Highlights must include 20-22 v Samonek at table tennis who would normally hope to keep Krenn at less than 10 to have a chance in total. Also, the squash in the final 21-10 v Peter Duyck was noticed. This makes Krenn a big challenger for the 2008 Tour Race. I am even quoted to say controversially that Krenn would have beaten anyone in this tournament apart from the World Champion Mikko. A bold statement but with such a solid performance Krenn played like the World Number Two and a future World Champion. 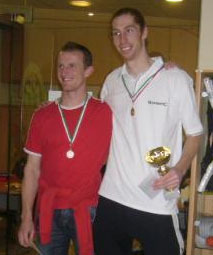 Winner of the last 6 tournaments on the Hungarian Racketlon Tour. Saying that I think perhaps the sternest test of all was not available - only in doubles. Levente Nándori has won the last 6 tournaments in the Hungarian tour but had a squash championship on Saturday so only played doubles. Nandori looks certainly to be one that can challenge the best. Robert Libal also played very well to make the semi-finals losing out to Duyck. On his way Libal defeated Ray Jordan & Gruber, the latter on a Gummi. Ray Jordan will never get a better chance to make a World Tour Semi-Final against someone he can win the first three sports at! Jordan clearly distraught after his break-up in doubles with Norton. Andy Petersons looking onwards considering Les Darcy's 86 Year Old High Jump exploits in his spare room. Norton claiming afterwards "I better return his Barry White CD's". Darcy indeed is a story to be told the World Over 85's table tennis champion did his knee in while practicing high jump in his spare bedroom. The venue wasn't perfect with wind assisted badminton and squash which was so bouncy it seemed like racketball, but as Marcel states on Racketlon.net the friendly atmosphere was a big plus, as was the free bottles of water and brilliant FIR Cards and Posters. I look forward to the results of the Sákovics project in 2012 and definitely plan to return to Budapest. 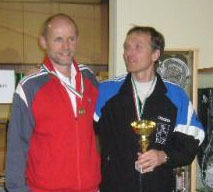 More results are available at racketlon.net and scores via the below link. See you maybe at the British Open in Ipswich in May - enter now at www.activeeurope.com (world ranking points) - or at Switzerland or of course the Doubles World Championships in London. 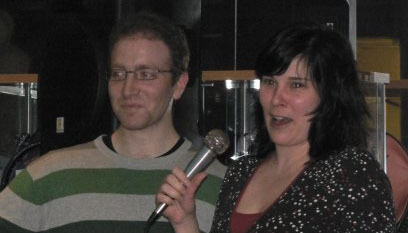 Report author Keith Lesser with tournament director Eva Kapcsos.